My first white-tailed buck, a nine point, taken on opening afternoon of the 2016 rifle season in Eastern Ontario. I never fully appreciated big game hunting until I shot my first white-tailed buck yesterday afternoon on the opening day of the 2016 rifle season here in Eastern Ontario. I took up big game hunting in earnest in 2011 under the tutelage of my good friend and hunting buddy Jason Quinn. Jay is an accomplished big game hunter with a lifetime of experience in the pursuit of white-tailed deer, moose and black bear. Under his guidance I shot my first white-tailed deer, a doe, in the 2012 rifle season. While killing my first deer was a thrill in its own right, the hunt I experienced yesterday was the culmination of all that is good in hunting: notably the challenges, camaraderie , effort, joys, sorrows and sportsmanship associated with hunting. The buck, my first, was hunted down and killed in a fair chase. I felled it using my Browning X-Bold Medallion bolt action rifle (left-hand) in 30-06 with a Winchester Super X 150 grain bullet. What this experience showed is I remain a novice deer hunter and with Jay as friend and mentor I am learning through trial and error. This entry was posted in Big game hunting, Firearms, Hunting dogs, White-tailed deer hunting and tagged Browning X-bold Medallion, buck, Eastern Ontario, German Wirehaired Pointer, Hunting, Jason Quinn, nine point buck, Nos, rifle season, Spencerville, white-tailed deer, white-tailed deer season, wild turkey on November 8, 2016 by geoffreyandmika. Hera checks out a bait pile of corn left by a deer hunter at Lester’s Square. 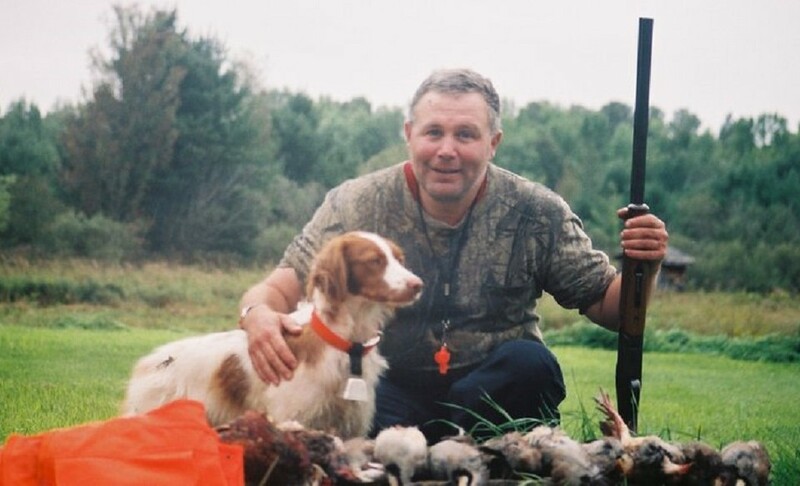 This entry was posted in Brittany (dog), Gun dogs, Hera, Hunter safety, Hunting dogs, Law and legislation, Pointing dogs, Ruffed grouse hunting, Small game hunting, Upland bird hunting, White-tailed deer hunting, Wildlife habitat, Woodcock hunting and tagged bog, cedar, cover, Cowan's Corner, dog, Eastern Ontario, Game, hunters, Lester's Square, Marlborough Forest, Varying hare, white-tailed deer, white-tailed deer season, Woodcock, woodcock hunting on November 5, 2016 by geoffreyandmika.